2. All Club Fee amounts, payments, and conditions, including satisfactory payment of any previously outstanding balances are defined on, and are to be made in accordance with, the terms on the Club Fees and Payment Schedule. 3. Any Club Fees payment not received 5 days after its due date will be past due and may result in the players registration card being pulled. Any player on a pulled registration card will NOT be permitted to participate in training sessions or play in games until the payments are current and the card is reinstated. 2. Team Fees and payment schedules are determined by the Club Leadership according to BSC guidelines. 3. Any players that are dual rostered on teams are expected to pay for their share of the "second team" expenses for any/only the events they are participating in. These events include: regular season game coach reimbursement expenses, tournament expenses and tournament coach reimbursement expenses. 4. Team Optional team purchases such as canopies or benches are not required and must have approval from every rostered player family and the Club Leadership, before purchase. 5. Any player reported to BSC by the team manager as being 15 days or more delinquent on Team Fees may be subject to the players registration card being pulled. Any player on a pulled registration card will NOT be permitted to participate in training sessions or play in games until the payments are current and the card is reinstated. 1. By signing below, you acknowledge that you have read and understand the players Club dues, players team fees, payment schedule, and player eligibility standards related to payments and that you are assuming financial responsibility for the Club dues and team fees for the entire playing year. 2. Refunds will only be considered for extraordinary events defined as relocation of more than 50 miles or the complete folding of a BSC team. 3. All payment schedules for Club dues and team fees must be met unless the club treasurer has approved, in writing, an alternative payment plan or awarded a financial aid scholarship. 4. Limited financial aid is available for families who meet BSCs approved guidelines and aid is awarded on a first-come, first-served basis until approved funds are exhausted. Any player wishing to apply for financial aid must return a completed Financial Aid Application and all required documentation by June 15th. Please be aware that copies of tax statements, pay stubs or other evidence of financial need will be required with your application NO EXCEPTIONS. 5. All additional travel expenses not included in the team fees are the sole responsibility of the player and players family. Expenses may include, but are not limited to: lodging, meals, fuel and other vehicle related expenses, entertainment, etc. I have read and understand BSC's policy regarding Club Dues and Team Fees. 1. The game of soccer, like many other sports, is a contact sport and can, at times, be played in a very physical manner. The inherent risks and dangers of playing soccer include the risk of injury, including concussions, from contact with other players, the ball, field equipment, goal posts, and/or the playing surface. All players and families who participate with BSC's soccer programs need to be aware of these risks and are encouraged to seek information on recognizing the signs and symptoms of a concussion. 2. While BSC coaches and staff are instructed to use good judgment and common sense in identifying and managing players who may be concussed, players and parents/guardians are hereby notified, and need to understand, that BSC coaches and staff members are not medical doctors and cannot be expected to provide a medically based diagnosis of a concussion, or any other injury, to players, nor provide treatment advice for any such concussion or injury. 3. As such, it is imperative that players and parents/guardians educate themselves in the area of concussions and take a personal responsibility for being proactive in managing the health and well-being of their players and themselves. Players who believe they may have a concussion, whether sustained during BSC activities or not, should communicate their concerns to their coach and should seek appropriate medical attention. 4. If a player is diagnosed as having a concussion, regardless of its severity, the affected player will not be allowed to participate in training or games until a written letter of release is obtained from a physician. 5. BSC and its coaches reserve the right to withhold any player from participating in training or games when either deems there is a reasonable possibility that a player is suffering from a concussion or concussion-like symptoms. I have read and understand BSC's policy regarding concussions. 1. As a member of Burlington Soccer Club (BSC), I hereby give permission to BSC and/or its teams/representatives/agents to use my name and photographic likeness in all forms and media for advertising, trade, and any other lawful purposes. I have read this release and approve of its terms. Here at BSC, the safety, well-being and sportsmanship of our players and parents are the primary concern and responsibility of the Burlington Soccer Club. We follow the NCYSA Discipline and Appeals Process for handling violations of the Code of Conduct. 1. Parents or any other team supporters may not approach a referee at any time for the purpose of disputing calls or making any abusive or offensive comments. 2. Parents or any other team supporters may not make any negative, abusive, or offensive comments to any players or parents on either team. 3. Parents or any other team supporters may not make any comments to any of the referees including the assistant referees on the sidelines. 4. Any coach, manager, parent, spectator that is dismissed from a game by an official must leave the complex immediately. The individual may not return to the field after the game. The dismissed parents child may be brought to them after the game. 5. Parents and any other team supporters must sit on the half opposite of the teams bench. You must leave at least 5 feet between the halfway line and the parents chair to allow for at least that amount of space between the opposing teams spectators. No spectators are allowed behind the goal. 6. Support and cheer in a positive manner for your players team. 7. As a competitive player or parent, I understand that the coach determines the amount of time and position each player has on the field. No player is guaranteed play time or a specific position. Positions and play time is earned and based on what is best for the team, as determined by the coach. 8. I understand that failure to attend or appropriately behave at practice or games which the coach determines negatively impacts the team or his/her ability to coach may result in a players removal from the team. As a players parent I will abide by the rules of the game and those set forth by the Burlington Soccer Club and North Carolina Youth Soccer Association, and will hold my child to this commitment. Violations of these standards will result in removal from BSC temporarily or permanently. This code of conduct is taking very seriously at BSC. 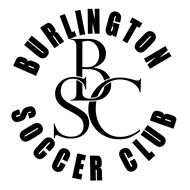 Burlington Soccer Club (BSC) strives to provide a value-based soccer experience for our members and players. As such, our ability to offer quality services and to operate as a going concern is dependent upon our members full commitment to the Club and their team and on members paying all Club dues and team fees in a timely manner. As a non-profit organization, our budgets are based on the number of registered players and projected/estimated operating costs based on level of competition, age group, and individual team needs. Once a player has committed to a BSC team and has met all requirements for registration, it is expected that the player will remain with BSC for the duration of the playing year and that the player and players family will be responsible for all BSC Club dues and team fees. BSC recognizes that many situations and circumstances can develop during a soccer playing year that impact a players ability to participate fully with a BSC team and that for many circumstances, including significant injury, a player or players family may wish to have a full or partial refund of dues or fees returned for lost playing time or other extended absences of participation. BSC does not provide refunds for situations involving significant or season ending injury. In these circumstances, BSC will refund, or provide relief for, prorated dues and fees based on the number of games the team was scheduled to play (league and tournament) and the number of games the player was unable to participate in, minus non-refundable amounts. Concerning a players release from the Club during the playing season, the requesting player/family must submit a written request for release stating the basis for such request to the BSC Board of Directors. The decision of the Board will be final in all cases. I have read and understand BSCs refund and release policy.